Sunday, Evan and I went to the Tate Modern with Ceres and Hannah. We were really excited to see some of the exhibits we weren’t able to make it to on our first trip, mostly up on the fifth floor. There were also some new installments on the third floor. My favorite one was 30 Pieces of Silver by Cornelia Parker. The piece, which took up a whole room, was a collection of 30 circular arrangements of flattened silver items — everything from forks and spoons to trophies and trombones — hanging from the ceiling and suspended about six inches off the ground. It was incredible to watch it hover, and all the steamrolled flat objects were intriguing. I wish we could have walked around the entire piece instead of just along two of its sides. There were also some extremely well-behaved and engaged children in the museum. There were stands offering workbooks to entertain the little ones, and many of them seemed absorbed in the activities, sitting on the floor, trying to copy paintings or create their own with stickers and pieces of paper. And I heard one little kid say, “It’s about the artist expressing himself…”! Someone’s doing something right in the education department. 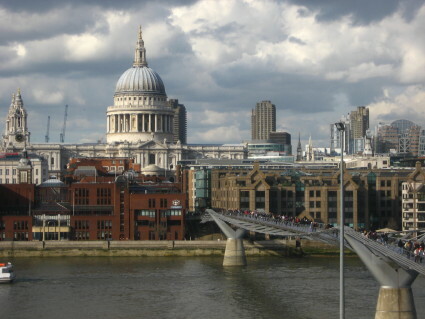 We also spent some time just enjoying the view of the Millennium Bridge, St. Paul’s Cathedral and the riverbank from the airy fourth-floor balcony.